Although presentism as a noun is relatively new, the idea in policy terms certainly isn’t. We used to call it hindsight. With the benefit of hindsight we can definitely say such and such was a dumb idea. But hindsight is limited to learning from the past and doing better in the future. Presentism is about not just learning from the past, but attempting to erase it. There is no doubt that the history of Canada, like that of all societies, offers much to learn from, and much to regret. No one wants to repeat the mistakes of the past. 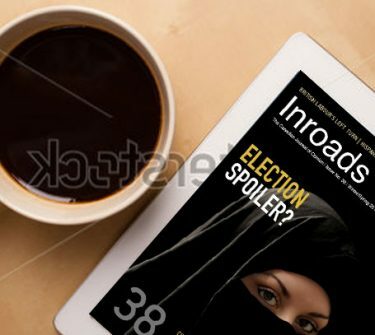 However, should hindsight become presentism? Should the lens of today’s knowledge, gained from decades of evidence, be used not only to condemn and address the outcomes of past policy decisions but also to eliminate from the public record all positive mention of historical figures associated with what by present standards are bad policies? These days of truth and reconciliation in Canada have brought the issue of presentism into focus. As Canada, and Canadians, struggle with the grim reality of history and its undeniable toll on Indigenous people, presentism has become how we often deal with the past. There are several examples. In his recent Queen’s Quarterly article (“The Perils of Presentism”), former journalist Jeffrey Simpson looks at the decision to change the name of the Langevin Block in Ottawa to the Prime Minister’s Office. The building across from the Centre Block on Parliament Hill had been named after Hector-Louis Langevin, one of the Fathers of Confederation, a former mayor of Quebec City, MP and member of the federal cabinet. Langevin’s name was taken down because of his role in establishing the Indian Residential School System in the 1880s. The City of Victoria decided to remove a statue of John A. Macdonald, Canada’s first Prime Minister, for his role in implementing residential schools. Yet another example was the decision by the Regina Public School Board to change the name of Davin elementary school to Crescents School because Nicholas Flood Davin, a prominent Regina newspaper editor, wrote a report in 1879 recommending the creation of residential schools. To presentists, the fact that Langevin was involved in the founding of Canada and did many good things doesn’t matter. As Minister of Public Works he led the construction of critical infrastructure such as railways, ports, post offices and various government buildings. All you need to know is that he once spoke in support of residential schools, and he is persona non grata. The argument against this attitude is that Langevin is being judged not by the standards, knowledge and understanding that existed at the time, but by those we know today. Three years later, Duncan Campbell Scott, Superintendent of Indian Education, echoed Bryce: “I can safely say that barely half of the children in our Indian schools survive to take advantage of the education we are offering them.”3 Then in 1922, Bryce wrote a book, The Story of a National Crime, that presented evidence of the role played by government in creating the conditions leading to student deaths. In the world of presentism there are many historical icons who could suffer Langevin’s fate. For example, former Saskatchewan Premier Tommy Douglas, once declared “The Greatest Canadian,” was an advocate of eugenics, which would systematically eliminate individuals with “subnormal” intelligence from the gene pool. In the leaders’ debate during the 1968 federal election campaign, in response to a question about legalizing homosexuality, Douglas said, “We ought to recognize it for what it is. It’s a mental illness. It’s a psychiatric condition.”4 Should Douglas be condemned and his name removed from the provincial Ministry of Health building in Regina? If consistent application of presentism leads to absurd outcomes, how should we view those who defended historical policy positions that we now categorically reject? How fair is it to judge past figures who made choices based on what, at the time, they believed were existing norms and in the public interest? Looking back, and based on subsequent evidence of more than a century, their beliefs and decisions have had wretched social and economic outcomes. But one can only assume they were doing what we’re doing now, and applying the standards of presentism from their time to make decisions. No doubt, 100 years from now people will look back at many of our decisions today and believe we were terribly misguided, ill-informed, or maybe even purposefully malicious. To judge those who made policy decisions in the past, one must do so from the perspective of the actual time and place. We need to transport ourselves back to their time. We should judge not on the basis of what we know today, but on the basis of what people knew and believed then and the reality they faced and were trying to address. In other words, put ourselves – as uncomfortable as it may feel – in their shoes. From the 1960s to the 1980s the child welfare system intervened, resulting in thousands of Indigenous children being eventually adopted by non-Indigenous parents. It is another example where presentism now shapes our judgement of those who undertook these large-scale apprehensions. The federal government has agreed to pay compensation for the undeniable toll they have taken. Presentism becomes the rationale to atone for what are deemed, in effect, to have been actions taken in the past to inflict harm. There is no shortage of documented and compelling cases from those years of children taken into care from intolerable circumstances. In these instances, with the safety of children paramount, on the basis of the experiences and findings of social workers and the courts, state intervention was deemed in the best interests of the children. Were mistakes made? Undoubtedly. Was there overreach? Very likely. But of course, that judgement is not made in the full context of the times; rather, it is based on what we know today. In even the most stark cases of state intervention, the court documents present the facts as they were known, but do not touch on the backstories that led to the misery of the lives exposed. The human toll is an outcome of numerous factors, many deeply rooted in history, poverty, racism and marginalization. But the challenge for the social workers and others in the social services and legal system was to deal with the reality confronting them. In their perception, the immediate need was to rescue the children from intolerable circumstances, and to do it in accord with the best protocols and professional practice of the time. Having said that, judgement is, by definition, subjective. Today, we can also say that the trauma of losing family ties, culture and language took a significant toll, and many have struggled to reclaim their Indigenous identity. How significant the toll was we do not know, since we never hear from or about those who were able to make the best of their new circumstances. Moreover, there is no counterfactual point of reference. In other words, we don’t know with any certainty what the outcome would have been had the children not gone into care and been left in situations that at the time were deemed unacceptable by social workers and the courts. The relevant point is not to cast retroactive judgement on others from a different time, but to look in the mirror and ask why so little has changed. The present is not much different from the past, a point made by the protesters on the grounds of the Saskatchewan legislature. The percentage of Indigenous children in care today – as shown in figure 1 – remains nothing short of scandalous. The question we should be asking ourselves is: Why has the Sixties Scoop become permanent social policy in Canada? The statistics are stark. It is in trying to answer that question that presentism can perhaps be instructive. Jane Philpott, the federal minister responsible for Indigenous Services, has labelled it a “humanitarian crisis.”8 It is particularly grim in western Canada, with Saskatchewan and Manitoba the most troubling. Provincial child and family service systems have changed in fundamental ways from the days of the Sixties Scoop, yet the outcomes remain similar. 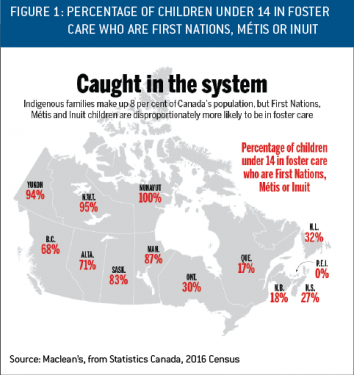 Although the adoption of Indigenous kids into non-Indigenous families seldom occurs now, the number of Indigenous kids in care is as staggering as ever. We know that losing extended family and cultural connections takes a heavy toll on children. Slowly, over the years, control of the child welfare system for Indigenous children has shifted to give greater authority to First Nations. Specifically, federal funding to various First Nation child and family services goes to agencies established, managed and controlled by First Nations themselves. They are mandated to provide prevention and protection services. But with adoption to non-Indigenous families an unacceptable alternative, Indigenous children often remain in permanent foster care. Complicating the situation is a lack of foster parents, particularly Indigenous foster parents, which means kids often live with non-Indigenous foster parents. Logically, a foster family has one stay-at-home caregiver. In today’s world of both parents working, that means the pool of foster parents is limited. So while permanent adoption of Indigenous kids considered at risk into non-Indigenous families has effectively ended, the underlying issue remains. Just as in the days of the Sixties Scoop, the courts are still taking Indigenous children by the thousands from their homes into protective custody. That needs to be the focus of presentism – not judging the motivations of others who believed they were acting in a responsible and moral way. Clearly, giving First Nations and Indigenous communities control over child welfare so that the sins of the past are not repeated is a critical element in addressing a disgraceful situation. But it is only part, and a relatively small part, of the solution. The challenge is to disentangle the intersection of layer upon layer of factors rooted in history stretching back for more than 150 years. Ultimately, Indigenous society needs to heal itself. That requires the commitment of all dimensions of Canadian society, Indigenous and non-Indigenous, to recognize our collective failures. The solution goes far beyond government policy; individuals and First Nation communities must lead. Until the complex factors of poverty, lack of opportunity, the need for cohesive family units, addictions, deeply embedded attitudes of racism, and absence of hope leading to despair are addressed in a meaningful way, the present will continue being no different from the past. 1 Jeffrey Simpson, “The Perils of Presentism,” Queen’s Quarterly, Vol. 125, No. 2 (Summer 2018). 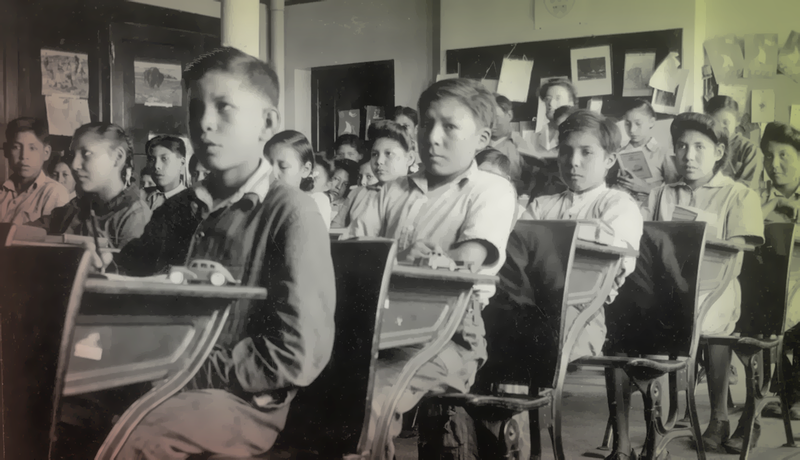 3 John Edmond, “Indian Residential Schools: A Chronology,” Law Now, July 7, 2014, retrieved from https://www.lawnow.org/indian-residential-schools-chronology. 6 See Arthur Milner, ed., “The Sixties Scoop Thirty Years Later: Inroads Roundtable,” Inroads, 2001, pp. 154–65.